Under the “Alien Registration Act of 1950” all registered foreign nationals in the Philippines, and ACR-I Card holders EXCEPT Temporary Visitor’s Visa holders or Tourist Visa holders must report to the Bureau of Immigration (BI) Main Office at Intramuros, Manila, or their participating offices within the first sixty (60) days of every calendar year. 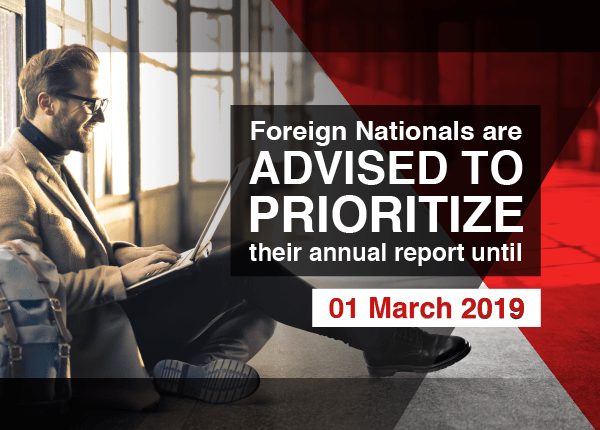 The Annual Registration for foreigners residing in the Philippines is scheduled from 03 January 2019 to 11 March 2019. For foreign nationals aged less than 14 years old, parents or legal guardians must report to the Bureau of Immigration offices on their behalf. The Annual Report period is from 03 January to 01 March 2018 and is NON-EXTENDIBLE. Failure to comply may result in the imposition of an administrative fine and/or imprisonment at the option of the Commissioner of the Immigration. Our Visa Services Department can process and pay the annual report application on behalf of the foreign national(s). To know more about this service, you may contact us at [email protected] or call us at (02) 224-1833. To learn more about Annual Reporting, Contact Us Today!